Please join us for a public reception and conversation with photographer Matt Herron and HAVC professor Martin Berger at the Porter Faculty Gallery on Thursday, October 27, at 5:00pm. In this election year, the Porter College Faculty Gallery is proud to present an exhibition of photographs by Matt Herron from the Selma to Montgomery March, the most significant of all civil rights marches and the one that led directly to the Voting Rights Act of 1965. 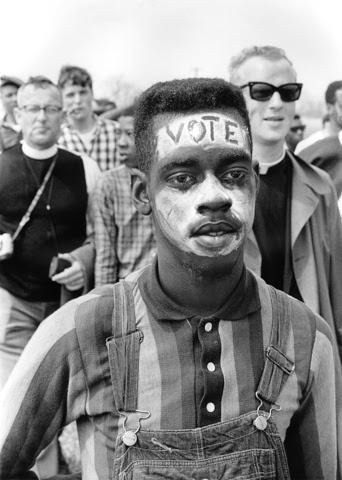 The Voting Rights Act mandated federal oversight of all US counties with a history of voter discrimination against African Americans, and opened the door to voting for most Americans. Matt Herron has been a photojournalist since 1962, and his pictures have appeared in virtually every major picture magazine in the world. Based in Mississippi in the early 60's, he covered the Civil Rights struggle for Life, Look, Time, Newsweek, and the Saturday Evening Post, as well as providing pictures for the Student Non-Violent Coordinating Committee (SNCC). In 1964 he founded and directed the Southern Documentary Project, a team of five photographers that attempted to document the process of social change in the South. In 1965, he won the World Press Photo Contest for a civil rights photograph. In the late 60's Herron became involved in investigating the assassination of President John F. Kennedy, working with New Orleans District Attorney, Jim Garrison. During that period he also founded and administered the Listening Eye Gallery, a New Orleans photographers' cooperative. In 1970, he set sail in a small boat with his wife and two children, bound for the west coast of Africa. The family spent a year and a half crossing the Atlantic and exploring eight West African countries. Their book, The Voyage of Aquarius, (E.P.Dutton, 1975) documents that quest. A recently published sequel, Our Big Blue Schoolhouse, recounts their passage down the West Coast of Africa in the words of their son, Matthew, who was 13 at the time. It's an adventure story for Middle School kids illustrated with Herron's photographs. In the 70's, Herron turned to writing, and produced a series of major articles for Smithsonian and other publications. He also became involved in ecology action, serving as bridge officer, navigator and photographer on two Greenpeace anti-whaling voyages, and a voyage to the ice floes of the St. Lawrence to protest the harp seal hunt. In the late 80's and 90's Herron became involved in labor organizing, serving for twelve years as a Director and then as President of the American Society of Media Photographers, the major trade organization that represents photographers who shoot for publication. Recently, Matt Herron curated a major exhibition: This Light of Ours: Activist Photographers of the Civil Rights Movement, which opened a new arts complex in Salt Lake City in October, 2011 and is now traveling throughout the United States. The University Press of Mississippi published a companion volume to the show in 2012. His one-man show, Civil Rights Under Three Hats: The Photography of Matt Herron is currently traveling across the country.